William J. Hedden, M.D. 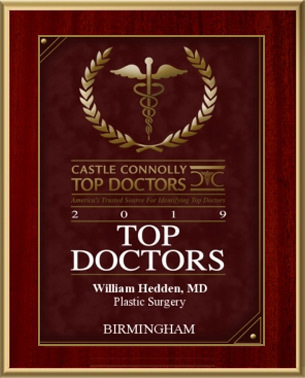 was named as a Top Doctor for 2019 by Castle Connolly Medical Ltd. This list of top physicians is presented each year to assist patients in locating outstanding plastic surgeons and other healthcare providers in their area. Castle Connolly Top Doctors are selected each year following an extensive process where physicians are nominated by their peers. The nominees are then carefully reviewed by a physician-led team that examines their professional qualifications, medical education and more. Dr. William Hedden is a board certified plastic surgeon who provides his patients with a new level of individualized care. Dr. Hedden has earned a world-wide reputation for his commitment to excellence in plastic surgery and the satisfaction of each patient. Founded by Dr. Hedden, Hedden & Gunn Plastic Surgery is a leading cosmetic surgery practice in Birmingham, Alabama. Castle Connolly Top Doctors maintains a listing of providers who were selected by fellow physicians and have passed the scrutiny of an extensive review process to benefit healthcare consumers by finding the most outstanding physicians.